So what is a carbon footprint? Generally speaking a carbon footprint is the measurement of total greenhouse gas emissions caused directly and indirectly by a person, organisation, event or product. A carbon footprint considers all six of the Kyoto Protocol greenhouse gases: Carbon dioxide (CO2), Methane (CH4), Nitrous oxide (N2O), Hydrofluorocarbons (HFCs), Perfluorocarbons (PFCs) and Sulphur hexafluoride (SF6). But usually Carbon Footprint is expressed in equivalent tons of carbon dioxide (tCO2e). The impacts of different greenhouse gases are compared to one unit of CO2 via the carbon dioxide equivalent (CO2e). CO2e is calculated by multiplying the emissions of each of the six greenhouse gases by its 100 year global warming potential (GWP) (source: www.carbontrust.com). So the simple definition of carbon foot print is: - “A measure of the amount of carbon dioxide released into the atmosphere by a single endeavour or by a company, household, or individual through day-to-day activities over a given period (Collins English Dictionary, 2012 Digital Edition). Usually a carbon footprint is calculated over a one year of time period. An individual carbon footprint is the sum of all carbon dioxide emissions produced by their lifestyles in a given time frame. According to Canada’s One-Tonne Challenge, every Canadian produces at least five tonnes of greenhouse gases directly each year. According to Environment Canada’s Greenhouse Gas Inventory, Canada produces a total of 747 million tonnes of carbon dioxide equivalent (CO2eq) annually. This includes those industrial emissions not incorporated into the direct emissions above. If average this number across Canada’s total population, that would mean that each Canadian produces approximately 24 tonnes of greenhouse gases every year. Organizational carbon footprint – All activities across the organisation such as energy use in the office buildings, vehicle use in the company purposes as well as production process of the organization contribute in organizational carbon foot print. Value chain carbon footprint – this carbon footprint is the results of outside organizational direct operation and it includes emissions of the suppliers and consumers related to the organization. Product carbon footprint- it accounts the emissions over the whole life of a product or service, starting from the initial stage to its end use and final reuse, recycling or disposal. 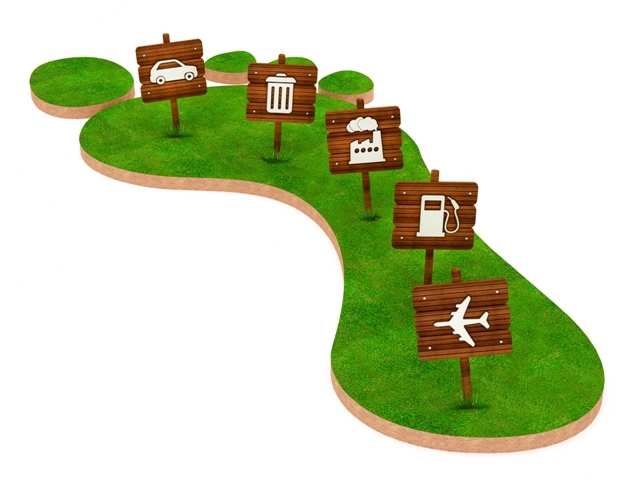 Find more about "what is a Carbon Footprint?"